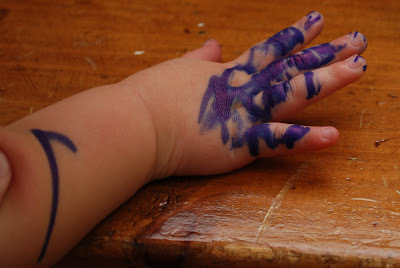 Why is it that when your toddlers finally find themselves alone with a marker, it's always a Sharpie instead of a washable Crayola marker? 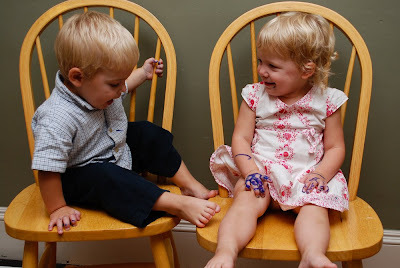 As you can see Abby & Zack were devastated when we put them in time out together. I am sure they will never do this again (yeah right). After I told them that what they had done was a very bad idea and that they had ruined my keyboard, Abby seemed much more concerned about herself. Apparently she also 'ruined' Zack's hand, lip, and ears. We still aren't completely sure what happened. 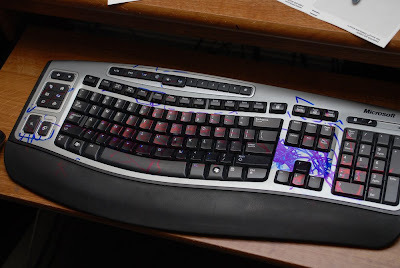 Whenever Abby comes and sits on my lap at the computer she looks down at the keyboard and says, "Zacky colored." Likewise, when Zack sits on my lap he says, "Abby colored, no, no." yeah... that was a week ago and Zack still has marker on the back of his ear. Nice. Ooooo...they're getting devious, those two. This might be the beginning of a lifetime of blaming the other twin. "Yeah, we snuck out last night. But it was totally Zack's idea!" "Hey, Abby said she was going and I just went along to make sure she was gonna be okay." They are little partners in crime. That is hilarious! Between peanut butter and sharpies...your kids win the medal for getting into everything!!! cute...did the marker come off their skin? Funny that they blame each other. Maybe Emily should have rehearsed her "tangled webs" lesson for Zach and Abby. and does time out really ever work? I'd say that Abby looks to be the offender. Plus sisters always try to blame their brothers for everything (and it usually works). For example... Emily says, "I didn't drive the car into Fower's market, it was Brady. He pulled the handle into reverse and I saw that we were going to go into the busy street and the ditch and so I pulled the car into drive to save us." Right Sis? Plus the look on Zack's face in the fourth picture is like, "Look at what she did to my ear." Lemme guess, everything was quiet? You maybe thought to yourself, "Wow, abby and Zack are playing really well right now..."
Too bad kids can't just molt when that happens. OH MY HECK!!! Wow! That is a funny story. I would have lost it! (See Rindi's blog for an explanation...) That is some serious sharpie coloring! I can't believe that! Markers are just too much fun. And nothing is more exciting than coloring on electronics. oh man we have all had a go with those sharpies! you are lucky... my sister-in-law came out of the shower to her entire couch walls covered. I love your kids! They are so funny! THis post is SO cute. That picture of the two of them is absolutely priceless. I love them. i stumbled onto your blog from the stucki's...i know Johnny from growing up...what a cute family! Emily, this is your long lost friend, Christine Segura! I love your blog, your kids are so much fun! You are obviously having fun as a mom. I want to keep in touch more and good old Millie set up a blog spot for us. Be patient, we just got it, so it is a little slow right now but I want to keep up on it. It is www.stuandchristinesegura.blogspot.com respond so I know you got this! Emily- I'm just sitting here giggling! 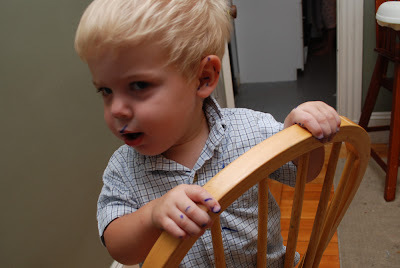 I swear toddlers can smell out where you hide markers! Your family is adorable!